Zakamensky District (Russian: Закаменский райо́н; Buryat: Захааминай аймаг, Zakhaaminai aimag) is an administrative and municipal district (raion), one of the twenty-one in the Republic of Buryatia, Russia. It is located in the southwest of the republic. The area of the district is 15,320 square kilometers (5,920 sq mi). Its administrative center is the town of Zakamensk. As of the 2010 Census, the total population of the district was 28,453, with the population of Zakamensk accounting for 40.5% of that number. 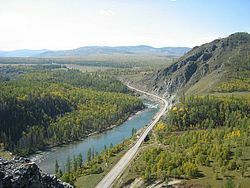 Within the framework of administrative divisions, Zakamensky District is one of the twenty-one in the Republic of Buryatia. It is divided into one town (an administrative division with the administrative center in the town (an inhabited locality) of Zakamensk), five selsoviets, and eighteen somons, which comprise twenty-six rural localities. As a municipal division, the district is incorporated as Zakamensky Municipal District. The Town of Zakamensk and Kholtosonsky Selsoviet are incorporated as Zakamensk Urban Settlement, while the remaining four selsoviets and eighteen somons are incorporated into twenty-two rural settlements within the municipal district. The town of Zakamensk serves as the administrative center of both the administrative and municipal district. Kholtosonsky Selsoviet used to be municipally incorporated as Kholtosonskoye Rural Settlement, but the latter was merged into Zakamensk Urban Settlement on July 18, 2015. Правительство Республики Бурятия. Постановление №431 от 18 ноября 2009 г. «О реестре административно-территориальных единиц и населённых пунктов Республики Бурятия», в ред. Постановления №573 от 13 ноября 2015 г. «О внесении изменений в Постановление Правительства Республики Бурятия от 18.11.2009 №431 "О реестре административно-территориальных единиц и населённых пунктов Республики Бурятия"». Вступил в силу 18 ноября 2009 г. Опубликован: "Бурятия", №216, Официальный вестник №120, 21 ноября 2009 г. (Government of the Republic of Buryatia. Resolution #431 of November 18, 2009 On the Registry of the Administrative-Territorial Units and the Inhabited Localities of the Republic of Buryatia, as amended by the Resolution #573 of November 13, 2015 On Amending Resolution #431 of November 18, 2009 of the Government of the Republic of Buryatia "On the Registry of the Administrative-Territorial Units and the Inhabited Localities of the Republic of Buryatia". Effective as of November 18, 2009.). Народный Хурал Республики Бурятия. Закон №985-III от 31 декабря 2004 г. «Об установлении границ, образовании и наделении статусом муниципальных образований в Республике Бурятия», в ред. Закона №1411-V от 14 октября 2015 г. «О внесении изменений в Закон Республики Бурятия "Об установлении границ, образовании и наделении статусом муниципальных образований в Республике Бурятия"». Вступил в силу со дня официального опубликования. Опубликован: "Бурятия", №1, Официальный вестник №1, 12 января 2005 г. (People's Khural of the Republic of Buryatia. Law #985-III of December 31, 2004 On Establishing the Borders, Creating, and Granting a Status to the Municipal Formations in the Republic of Buryatia, as amended by the Law #1411-V of October 14, 2015 On Amending the Law of the Republic of Buryatia "On Establishing the Borders, Creating, and Granting a Status to the Municipal Formations in the Republic of Buryatia". Effective as of the day of the official publication. ).